The entire top 10 is within 6 pounds of Thrift’s lead. With many in the top 10 catching 30 or more fish a day – and a lot of good ones – there’s no predicting the outcome, except to guarantee that Sunday at Cumberland will be one to remember. 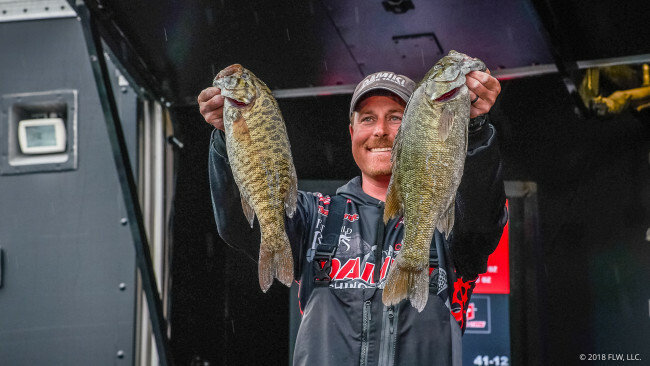 The main patterns are targeting staging and spawning smallmouths with swimbaits, and targeting staging and spawning largemouths with spinnerbaits. The two patterns seem to be producing at about an equal rate. He keeps his Ranger out off the bank, makes a long cast in and brings the bait out over the fish at an extremely slow speed. Andy Morgan has ridden one pattern all week long and has no intentions of changing it up on Sunday. He’s fishing a spinnerbait through flooded trees in a major tributary on the lower end of Lake Cumberland. “I caught four this morning just going down the bank with a spinnerbait. Two were pretty good ones,” he says.